Villa Aphrodite is one of the best villas we rented all over europe. The house is well equipped and perfect for those, who want to do trecking at the AKAMAS-peninsula. Troodos-mountains are far away, it takes more than 1,5 hours to go there. But in late march we prefer the lovely trecks at Akamas. The track at Avakas-Gorge is very difficult and not to be done with sandals or sneakers! Some hints for german people: 1) try to rent a car with automatic ! Helpfull: billiger-mietwagen.de 2) best supermarket at Paphos is - to our opinion - the Alpha Mega, you pass by coming from the airport. 3) good restaurant to be reached by foot: Aphrodite Beach Hotel (! ), not at the beach, not the Bath of Aphrodite Taverna. Try the buffet or the fish-Meze. Excellent well equipped villa, great hamper! Dear Irene, Just a quick note to thank you for recommending this fabulous property to us. As you know we had visited the beach previously on a day trip, so it was really wonderful to have it all to ourselves. On a couple of evenings, we took our bottle of wine and a picnic to the beach then deserted, and had a gorgeous swim in the warm sea, then laid under the starlit sky, we could not ask for more.... Isobella Sinclair. Dear Irene We returned from Aphrodite Villa last week and I just wanted to let you know that we had an amazing time. The villa was wonderful. The location was tranquil and stunning and we would have no hesitation in recommending it to anybody who requires a restful holiday. We enjoyed the sights and hospitality of Cyprus and are hoping to return in the future when we will certainly be trying to book Aphrodite again. Thanks and regards Nicola M.
Perfect. I was in desperate need of peace and tranquility, I found this and more! "An artistically and lovingly decorated 2-bedroomed villa in our favourite spot in Cyprus...on the Akamas peninsular, near Aphrodite's Pool." 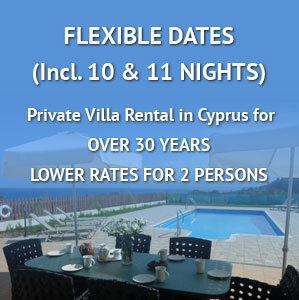 Hi Irene, Just returned from our holiday in Cyprus staying at the Aphrodite Villa. This Villa was absolutely lovely. We were met by the owner who was friendly and welcoming, and had baked a lovely cake for us and put a vase full of red roses on the table. 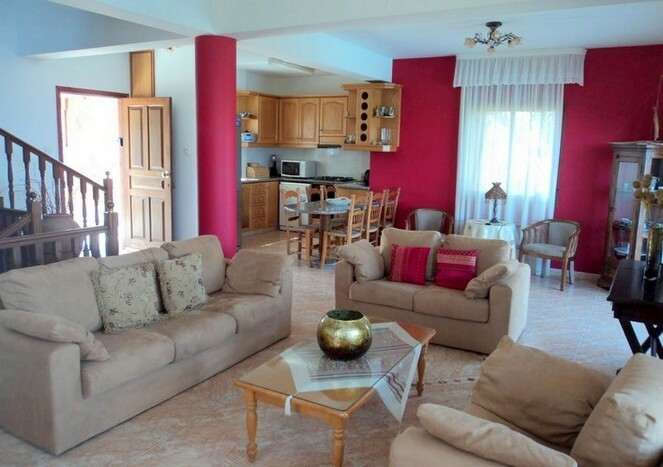 The Villa was decorated to a high standard and the furniture and fittings exceptional a very comfortable place to be. The view from the bedroom balcony is exceptional and to the left, is beautiful. We had a lovely time and wished we had booked two weeks. We did ask Nicole if the villa was booked from 29th, it was so we couldn’t extend our stay. We would consider booking again for next year for two weeks ... It was a truly lovely holiday and thank you so much. Brenda and Bob S.
Many many thanks for one of our best holidays ever. Fantastic! We love your villas!